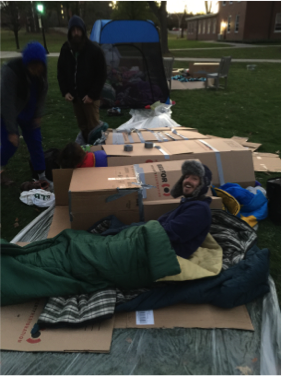 The Cardboard City Sleep Out is a chance for students and youth from across Greater Hartford to raise awareness, deepen their understanding and take ownership of one of our city’s most prominent social injustices. Creating a positive and productive space to hold that sometimes difficult conversation is an important part of what Journey Home does. The gathering of students that took place on November 13th made a clear statement; that the future leaders of our country are ready to end homelessness for good. The bright young faces started pouring through the doors of McGovern Hall around 6pm; sleeping bags in hand and cardboard stuffed under their arms. They checked in at registration where volunteers from University of St. Joseph took down their names, collected pledges and stacked donations. An honest energy was filling the hall, an understanding that we were all there to put our busy lives on hold for one night, so that an end to homelessness might be one step closer. Matt Morgan was first to take the stage, and the first to share his unique perspective as Journey Home’s executive director and a local leader in the fight against homelessness. Always passionate and brimming with positivity, Matt assured the crowd that their being here was of the utmost importance. By adding new points of view, encouraging new discussions and offering different tools along the way, each Cardboard City presenter to follow was there to share their contribution to the solution. The first was Jose Vega, the charming and dedicated director of Hartford’s McKinney Shelter, who shared 20 years of service through a series of stories and photographs. Representing the Hands On Hartford Faces of Homelessness Speakers Bureau was Sarah Ratchford and Gerard Rioux, former homeless residents of Hartford who have now dedicated their lives to education and advocacy. Christina Zarella, a graduate of Harvard, and former alumni of USJ, spoke on her experience as a homeless youth, and those of other young people she met on the streets of California in the 1990’s. Together these guest speakers provided the audience with detailed accounts from the front lines, and a view from the ground in the fight against homelessness. It was those stories that added honesty and authenticity to the activities and peer-to-peer discussions facilitated later by USJ professors Anthony De Jesus and Katie Martin. As respective directors of the Masters of Social Work and Public Health programs, they offered an academic perspective on the interplay between poverty and privilege, and provided tools to explore how those social dynamics are expressed in our everyday lives. When 11 pm rolled around the students switched gears and headed outside. A mad scramble ensued to secure the proper amount of cardboard, plastic and tape that would constitute an acceptable shelter in which to weather a chilly night. By midnight, the campus green was peppered with makeshift tenements, where chatter, laughter and the swishing of sleeping bags was beginning to die down. Tonight as they slept, or didn’t sleep, they would be making a silent statement: that homelessness cannot be ignored or pushed to the fringes of public discourse. Here, bright young minds had taken a Friday night out to speak up for one the most overlooked and marginalized populations in our city. By 8 am the majority of cardboard city had been dismantled, and the soggy, groggy inhabitants stumbled off with day-old bagels in their hands. They left behind a pile of new socks, gloves, hats and hygiene products that were donated later that week to Hartford’s Day of Sharing and Caring. They also left Journey Home with about $250 in donations, a heartwarming sum pulled from the slim budgets of college and high school students. Most importantly there was a feeling left in the air, a sense that just by coming together and opening this rare dialogue, they had made difference.